A party invitation for a Boys gymnastic party. Send us a photo that we can use to transform your child into the featured gymnast showing off his strength performing on the Rings. We’ll customise the invitation further with your party information. The details for your party will be printed on to the chalkboard background. We’ll send you the final jpeg version of the invitation so that you can print off as many party invites as you need. If you have a birthday girl the see our Girls Gymnastic Party Invitation. 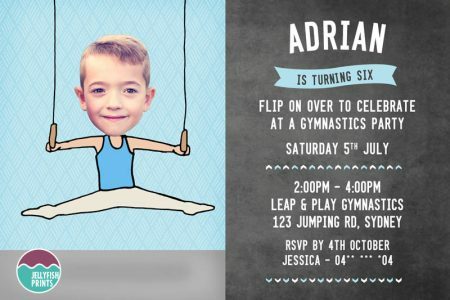 Another Gymnastics birthday parties invitation – this one for a boys birthday celebration. This party invitation would be great for a party held at a Gym venue,a play and jump trampoline park or at home with tumbling kids and fun party games. Customise your party invitation. Any of the colours can be changed to your childs favourite colours or to suit your party theme decorations. You will receive a customised “print it yourself” digital invitation JPEG file. Emailed to you and ready to print at your local photo lab or on your home printer. Your printable Boys Gymnastics party invitations will be personalised with your party details and a photo of your little gymnast. Choose to receive your invitation as either a high resolution .JPEG image file – perfect for printing at a photo lab, or as a PDF file that you can print from your printer. We will email your invitation in your chosen file format (jpeg or pdf) within 1 Business day. Emailed to you as a high resolution .JPEG digital file format or as an A4 PDF file with 2 invites per page.